Explanation: Vega is a bright blue star 25 light years away. Vega is the brightest star in the Summer Triangle, a group of stars easily visible summer evenings in the northern hemisphere. The name Vega derives from Arabic origins, and means "stone eagle." 4,000 years ago, however, Vega was known by some as "Ma'at" - one example of ancient human astronomical knowledge and language. 14,000 years ago, Vega, not Polaris, was the north star. Vega is the fifth brightest star in the night sky, and has a diameter almost three times that of our Sun. Life bearing planets, rich in liquid water, could possibly exist around Vega. 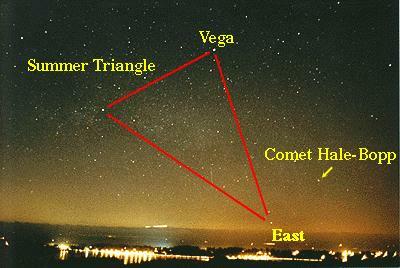 The above picture, taken in January 1997, finds Vega, the Summer Triangle, and Comet Hale-Bopp high above Victoria, British Columbia, Canada.